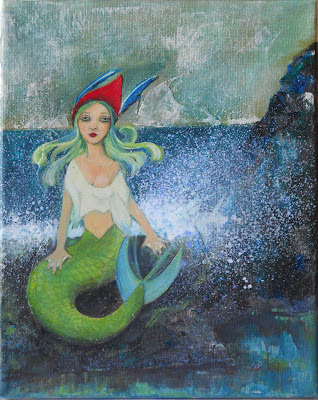 This is a Merrow...an Irish mermaid-like sea nymph. the waves. If she loses her cap, she cannot return to the water. extremely ugly, who can blame them? they will live happily with their human family. husband and children behind, and never be seen again. taking Suzi Blu's Mermaids class. St. Paddy's Day, but 'twas not to be. Check out her awesome photography! to see all of the green entries. Lovely painting. I'd never heard of merrows, so thanks for the explanation. I LOVE this- her expression and EYES are wonderful- and that splash of water is incredible! I also love the story behind Merrows which I'd never heard of before either! Oooo I do love this! The deep ocean-y colours, her haunting, watery eyes, the texture of the spray - all wonderful!! Once I read a novel about this. A family lived at the edge of the sea in Ireland. The mother disappeared. She went back into the sea. Her husband was accused of murder.It was a good book. Your artwork is amazing! Ilove how the water is reflective and transparent...that's hard to achieve...and the sky! I LOVE it :) Of course the merrow...she is beautiful! I've never heard of that legend--love to read new things like this. I love this painting and story of the Merrows. You're a very talented painter. I like the colours, sea spray effect and the proud Merrow's expression. I've not heard this legend but in Cornwall we have mermaid legends that are fun. Have you ever read "The Mermaid's Chair" by Sue Monk Kidd? Good fictional novel that uses a mermaid legend as inspiration. Just thought I'd mention it cause I seem to remember reading you're a book lover. Thanks, everyone, for the wonderful comments! I love to read them! Gemma, that novel sounds so good...do you remember the name of it? Kat, yes, I did read The Mermaid's Chair. It was so good...I enjoyed it very much! Miss Magpie, That mermaid is so sweet! Love it!